The year after Nouveaux’s first record came out, I met an executive for Word Records (Christian record company) at a Petra concert. He wasn’t actually a Christian, and he told me his favourite bands were Def Leppard and ZZ Top (which he pronounced “Zed Zed Top”. In retrospect, this makes me doubt how much of a fan he really was). “Def Leppard!” I exclaimed, never having heard a note by them in my life. “You must love Nouveaux then.” He insisted that Nouveaux were nothing like Def Leppard. His colleague (who was a Christian, and also probably more aware of the marketing strategy), insisted that Nouveaux sounded “just like Def Leppard”. Listening now, I think the non-Christian had the right of it. Only the backing vocals on this record are particularly Leppard-esque. Maybe that didn’t matter. After all, the target market was kids like me who weren’t allowed to listen to Def Leppard. It didn’t have to sound exactly the same. It just had to sound plausibly similar. This album became a cult favourite on the mainstream melodic rock scene too. There are quite a few Christian rock bands from this period who are popular with secular AOR fans. I think that’s because in 1994, melodic rock was dead. Rock fans jumped on Christian output because there was no longer a secular scene. Previously platinum-selling bands were getting dropped like stones from their record labels, and even giants like Mötley Crüe were releasing appalling attempts to sound fashionable and bombing commercially. The Christian industry, on the other hand, had always worked by copying the secular marketplace. Because it takes a couple of years to go from signing a band to releasing, and because the Christian industry were just reacting to secular changes, everything ran a few years behind. The first major Christian grunge release was Grammatrain’s Lonely House, a year after Kurt Cobain died. And that’s why in 1994, Christian labels were tipping money into bands that sounded like Def Leppard and Bon Jovi, while the mainstream labels were writing those kinds of bands off as tax losses. The “Christian equivalent of…” phenomenon was even stronger with X-Sinner, a band who were blatantly sold as the Christian AC/DC (I read somewhere, but cannot now find a link, saying the members of X-Sinner now sometimes work as an AC/DC tribute band). By the time I discovered them, X-Sinner’s debut album was out of print and impossible to obtain; in that pre-downloading era, I only managed to lay my hands on two songs via compilation albums. I had r arely played air guitar so vigorously. There were tons of clone bands like this. Trytan were known for their resemblance to Rush; Deliverance were sometimes called “the Metallica clones” (the band’s Wikipedia page claims that Lars Ulrich named their single “Weapons of Our Warfare” as one of his ten favourite metal videos of all time). It didn’t really matter how accurate the comparisons were, as long as they were close enough to keep Christian teenagers away from the devil’s music. I used to buy some of my CDs from a Christian mail order business called RadRockers. It’s now defunct, but you can find their website on the Wayback Machine. It had a highly useful feature called the “Sounds Like Chart”. “Use this chart to get a feel for how our favorite CCM artists compare with the secular Mainstream” boasted the page. There followed a huge table of Christian rock artists; one of the columns was headed “Recommended if you like these mainstream artists”. I can’t link directly to the archive of that page, but you can click to enlarge the screenshots. Here’s another site doing the same thing. It’s pretty obvious that whoever wrote these didn’t know much about music. 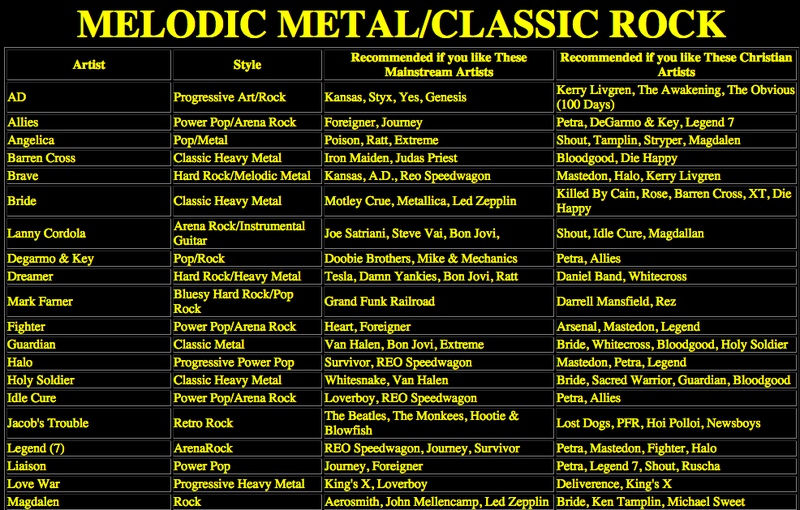 Various forum posts show that rock fans were unimpressed by the RadRockers chart. One poster describes the RadRockers chart as “maligned”, and I’m sure it was by people who knew about secular music. But that wasn’t a problem, because Christian rock fans like me had little opportunity to make direct comparisons. The idea was that if there was a passable Christian pastiche, we good Christian kids wouldn’t listen to secular rock, and then we wouldn’t be influenced by the secular bands to start worshipping Satan, shooting heroin, and attending bisexual orgies, which is what Christian anti-rock propaganda told us the secular bands did. Posted on October 30, 2014, in Atheism, Christian rock, Christianity and tagged AC/DC, Christian rock Thursdays, Def Leppard, Deliverance, Metallica, music, Nouveaux, RadRockers, Rush, Trytan, X-Sinner. Bookmark the permalink. 7 Comments. ‘Zed Zed Top’. He was obviously English!! Or Canadian. Took me years to figure out I was saying it wrong! You say zed in Canada? My my, y’learn something new every day. There is actually a currently active semi/sorta Christian DOOM METAL band out there right now (English, actually) called My Silent Wake. Have to say they have been consistently outstanding, and their theology is definitely of the questioning/liberalish side of things, so it doesn’t bother this misotheist very much. You can even sample them on iTunes! And don’t forget the Christian death-metal band Demon Hunter, which was actually in the first MTV Headbanger’s Ball compilation CD in 2003. I didn’t realize DH was a Christian band until a year later, when I was idly looking through a Christian Family bookstore and found a copy of Triptych. I’m no longer conservative or Christian, so I tend to interpret the songs very differently from the way the band intended (especially “Not I”). Honestly, I would have considered Idle Cure to be the gospel version of Def Leppard.